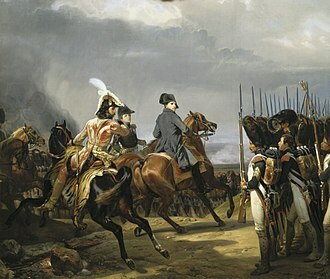 On 19 October, Napoleon evacuated Moscow and marched south-west to Kaluga, Eugene de Beauharnais leading the advance. 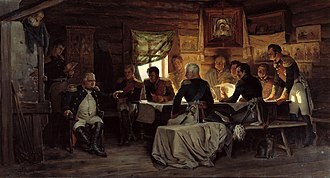 Unaware of this, and believing the force sighted at Fominskoye, 40 miles south-west of Moscow, was a foraging party, Kutuzov sent General Dokhturov with 12,000 infantry, 3,000 cavalry and 84 guns to surprise it. While on the road, Dokhturov learned this force was the Grande Armée and decided to hold out until reinforcements came at the road junction and town of Maloyaroslavets, on the Luzha River. Dokhturov entered the town from the south and found the French spearhead had seized a bridgehead. Fierce fighting began. General Raevski arrived with 10,000 more Russians; once more they took the town, though not the bridgehead. 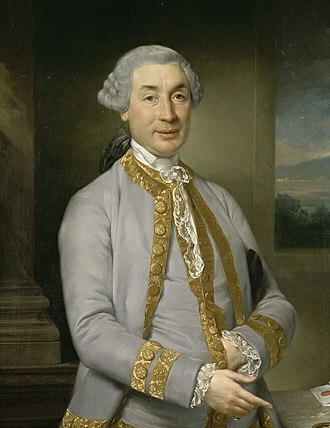 De Beauharnais threw in his 15th (Italian) division, under Domenico Pino (Minister of War of the Kingdom of Italy), and by evening they had again expelled the Russians. 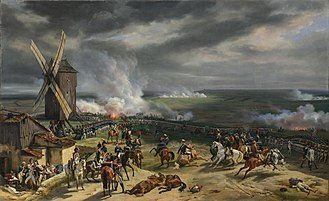 During the course of the engagament the town changed hands no fewer than eight times and it was quoted that the French and in particular the Italian Royal Guard under Eugène de Beauharnais 'fought like lions'. 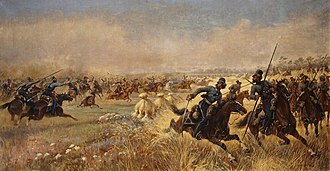 In fact, this battle is remembered as the "Battle of the Italians". Marshal Kutuzov arrived and decided against a pitched battle with the Grand Army the next day, and to retire instead to the prepared line of defense at Kaluga. 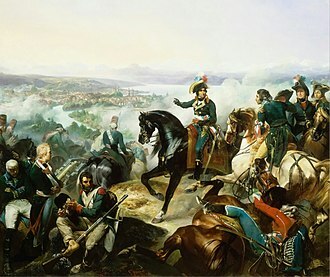 The mainly French and Italian forces won a victory on the day, only to realize that "unless with a new Borodino" the way through Kaluga was closed. This allowed Kutuzov to fulfill his strategic plans to force Napoleon on the way of retreat in the north, through Mozhaisk and Smolensk, the route of his advance that he had wished to avoid. French casualties were about 6,000 including Delzons killed, while the Russians lost 4,412 men killed and wounded, 2,753 were missed in action. More than half of Russian infantry units who fought in the city were inexperienced recruits and militiamen, which accounted for the high casualty rate among them. After the withdrawal of Kutuzov it became clear to Napoleon that he would be unable to force the Russian army into a decisive battle. 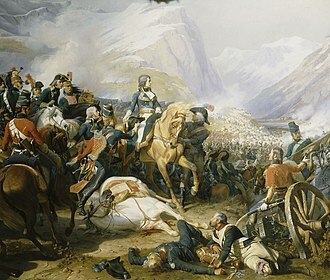 Though a victory, Napoleon did not feel it was on a large enough scale to counter the news of Murat's earlier defeat at Vinkovo. 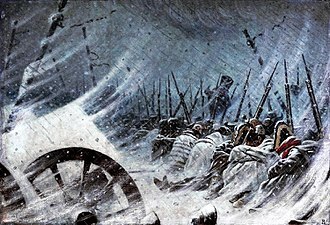 Following the battle Napoleon turned the Grande Armée west to Borovsk where the greater part of the artillery and wagons were located. This would be the first step in a retreat away from the Russians, with hoped-for winter quarters for the army potentially at Smolensk. ^ a b Chandler, p. 1041. ^ "Васильев А. А. Сражение при Малоярославце 12.10.1812 // Малоярославец (очерки по истории города): К 180-летию Отечественной войны 1812 года. Малоярославец, 1992. С. 16-87, 143-148" (PDF). ^ Caulaincourt 1935, p. 177. It was first mentioned in 1231 as an appanage of Chernigov, it was named after the Mozhay River, whose name is of Baltic origin. Later it was an important stronghold of the Smolensk dynasty, at one time owned by Theodore the Black, the Muscovites seized it in 1303, but in the course of the following century had serious troubles defending it against Algirdas of Lithuania. The principality was held by a younger brother of the ruling Grand Duke of Moscow. In 1562, the Treaty of Mozhaysk was signed there, Town status was granted to Mozhaysk in 1708. 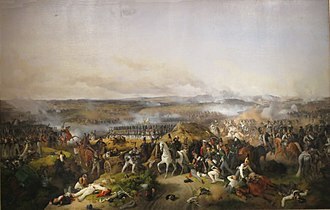 Mozhaysk continued to defend the Western approaches to Moscow during the French invasion of Russia in 1812, the Battle of Borodino took place 12 kilometers from the town. Within the framework of administrative divisions, Mozhaysk serves as the center of Mozhaysky District. As an administrative division, it is, together with twenty-one rural localities, as a municipal division, the Town of Mozhaysk is incorporated within Mozhaysky Municipal District as Mozhaysk Urban Settlement. The first stone cathedral was built in the kremlin in the early 14th century, in 1849, it was demolished stone by stone, a larger blood-red cathedral in the Gothic Revival style was completed in 1814. The church of St. Joachim and Anna preserves some parts from the early 15th century, another important landmark is the Luzhetsky Monastery, founded in 1408 by St. Ferapont and rebuilt in brick in the 16th century. The monastery cathedral, erected during the reign of Vasily III, was known for its frescoes. The fact that Mozhaysk was frequently the last major stop on the way to the capital, gave birth to the expression to push beyond Mozhay, which literally means push away further than Mozhaysk. Mozhaysk is twinned with, Château-du-Loir, France Drochtersen, Germany Etropole, Bulgaria Lohja, Finland Pereiaslav-Khmelnytskyi, Ukraine Ujazd, Poland Vileyka, Постановление №123-ПГ от28 сентября2010 г. «Об учётных данных административно-территориальных и территориальных единиц Московской области», в ред, Постановления №252-ПГ от26 июня2015 г. «О внесении изменения в учётные данные административно-территориальных и территориальных единиц Московской области», Опубликован, Информационный вестник Правительства МО, №10,30 октября2010 г. Закон №95/2005-ОЗ от30 марта2005 г, «О статусе и границах Можайского муниципального района и вновь образованных в его составе муниципальных образований», в ред. Закона №128/2011-ОЗ от15 июля2011 г, «О внесении изменений в Закон Московской области О статусе и границах Можайского муниципального района и вновь образованных в его составе муниципальных образований». 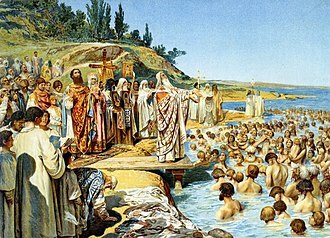 Вступил в силу со дня официального опубликования, Подмосковье, №59,2 апреля2005 г. Marshal is a term used in several official titles in various branches of society. As marshals became trusted members of the courts of Medieval Europe, during the last few centuries, it has been used for elevated offices, such as in military rank and civilian law enforcement. Marshal is an ancient loanword from Old French, which in turn is borrowed from Old Frankish *marhskalk, being still evident in Middle Dutch maerscalc, marscal and it is cognate with Old High German mar-scalc id. modern German Marschall. 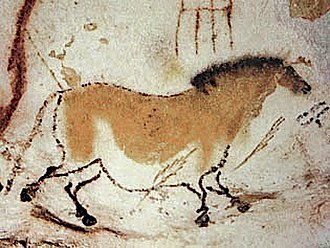 It originally and literally meant horse servant, from Germanic *marha- horse and this horse servant origin is retained in the current French name for farrier, maréchal-ferrant. 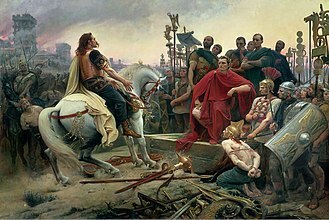 The late Roman and Byzantine title of comes stabuli was adopted as a Latin analogue, which has become the French connétable and, derived from the French, finally, in Byzantium a marshal with elevated authority, notably a borderlands military command, is known as an Exarch. In many countries, the rank of marshal, cf. field marshal, is the highest army rank, the equivalent navy rank is often admiral of the fleet. Marshals are typically, but not exclusively, appointed only in wartime, in many countries, especially in Europe, the special symbol of a marshal is a baton, and their insignia often incorporate batons. In some countries, the marshal is used instead of general in the higher air force ranks. The four highest Royal Air Force ranks are marshal of the Royal Air Force, air marshal, air marshal. The five-star rank of marshal of the Air Force is used by some Commonwealth, in the French Army and most National Armies modeled upon the French system, maréchal des logis is a cavalry term equivalent to sergeant. Some historical rulers have used special marshal titles to reward certain subjects, though not strictly military ranks, these honorary titles have been exclusively bestowed upon successful military leaders, such as the famous grand marshal of Ayacucho Antonio José de Sucre. 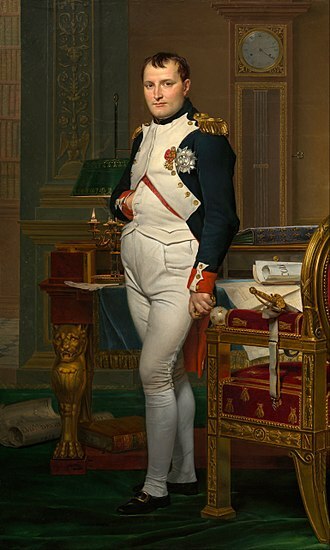 Most famous are the Marshals of France, not least under Napoléon I, in England during the First Barons War the title Marshal of the Army of God was bestowed upon Robert Fitzwalter by election. The Convent of Saint Nicholas, Maloyaroslavets, still serves as a monastery today. The great monument on the Raevsky redoubt was dedicated by Nicolas I in 1839.